The European School Chess Championship continues in Kallithea, Greece. Andrey Esipenko in the U11 Open group and Wassel Bousmaha in the U7 sections are the only players with perfect score at the championship. After six rounds the U13, U15, and U17 groups all leads are shared with 5,5/6. In the U17 Open group CM Cankut Emiroglu and Agil Pirverdiyev continue in shared lead one and a half points ahead of competition. With equal score in the U15 gropu is headed by CM Vahap Sanal and FM Ali Marandi Cemil Can. The U13 section is headed by Bulat Murtazin and Volkan Sevgi. WCM Arda Cagil Irmak and Hereklioglu Sude are with 4,5/6 in the U11 girls section, but they are closely followed by 3 players with 4,0/6. Sade Defne with 4,5 is leading the U9 Girls section. 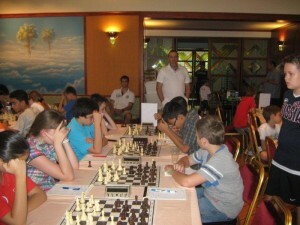 Sole leader of the U9 Open section is Uzumcu Ahmet Utku.